The most common reason that patients seek treatment for heel pain and one of the most common causes of foot pain is due to plantar fasciitis. It’s common enough that people assume that they have it. It is something that people are occasionally misdiagnosed with as well because it is so common. Plantar fasciitis is an inflammation of the plantar fascia, which connects your heel bone and spreads out to attach to five bones in the ball of your foot. The plantar fascia is a supportive structure which functions to reduce spreading of the foot. The inflammation of the plantar fascia is due to overloading and is a type of repetitive stress disorder. Plantar fasciitis is the common term and it is the term that I will use mostly here but it could be something similar. In some situations, the inflammation in the plantar fascia gives way to a degenerative process that occurs in the fascia and this is termed plantar fasciosis. The symptoms and treatment for plantar fasciosis are basically the same as for plantar fasciitis, except that the degenerative characteristics of plantar fasciosis typically means that it is been present for a longer period of time and that the recovery will take longer. experience, patients that also have pain towards the end of the day after they have been on their feet for a long time have likely had the process going on in a severe state for a long period of time. The examination for plantar fasciitis is typically extremely simple. There are couple of things that need to be checked to make sure that it is not a different cause that has a similar type of history. People will sometimes have both plantar fasciitis and an additional condition. A proper examination will help to make sure that all problems are being addressed. On occasion, laboratory tests may need to be ordered to be sure that the cause is not related to inflammatory arthritis. One of the biggest myths about plantar fasciitis is the concept that bone spurs cause the pain associated with it. As previously stated, the plantar fascia attaches not only to the heel itself but also spreads out to attach in the ball of the foot near each toe. Because of the fact that the plantar fascia spreads out at the toes, the majority of the forces are directed towards the heel. This means that the heel is under constant tension when the person is on their feet. The plantar fascia pulls a section of bone out in order to form the bone spur. This is just what happens when bone is under pressure for a long period of time. The same general idea occurs when a person get braces and the pressure created on a tooth can actually drive it through the bone of the jaw to end up in a completely different location. The pain associated with plantar fasciitis has nothing to do with the heel spur itself, but the inflammation and damage caused to the plantar fascia due to poor biomechanics and overuse. Dr. Royer has a series of five steps that he does to treat plantar fasciitis. Obviously, people will vary in what they need but the following step are taken in some degree or another by the majority of patients in my office needing treatment for heel pain. Adjustments to the foot and ankle, if needed. As stated previously, a good degree of the pain associated with plantar fasciitis is due to the inflammation caused by overloading the tissue. The pain must be dealt with in order to help the patient heel because the patient is going to have to appropriately load the tissue incrementally over time. There are several ways to help squelch the fire. One of the most obvious ways to do this is using ice and I specifically recommend that my patients use ice baths. Something else that can help is modifying the activity that seems to be perpetuating the problem. This can obviously depend on the patient because a person that stands all day for their job probably is not going to be able to sit for it and a runner will usually refuse to decrease the intensity or the length of their runs. That being said it is something to try to address. Another thing that can take a load off of the plantar fascia is to use custom foot orthotics. Orthotic should be used as a temporary type of device in most patients and should not be prescribed to a patient for long-term use. Obviously, an exception is made for any patient who is unwilling or unable to do their homework and earn their way out of the orthotic. One thing that I do not believe helps to squelch the fire are night splints and because of this I do not recommend their use. While it is not always needed, restrictions in the foot and ankle are extremely common. The foot and ankle is one of the most common areas of joint dysfunction in the body. Restrictions in the amount of movement at the ankle can directly lead to the arch of the foot collapsing. Restrictions can occur from postural and lifestyle issues. Manipulation or adjustments of the foot and ankle can locally cause a decrease in pain, a decrease in inflammatory markers in the foot itself and increasing sensory feedback from the ankle. It is known that in people that have joints that are painful and/or restricted that individuals have a hard time knowing where that body part is in space. Improving the motion of the foot and the ankle makes it easier to move the joint and easier for the brain to know where the joint is in space. Both adjustments and exercise increase the connection between the brain and the foot when they are applied. Kinesio taping is multifactorial and has the ability to control the fire by supporting the arch when applied properly. Kinesio taping actually straps the arch and more of a supinated position and decreases the load on the plantar fascia. It is believed that one of the methods by which kinesio taping works at decreasing pain is due to his by stimulating the touch receptors and stopping pain at the spinal cord level (gate control theory) and improving sensory feedback from the foot. 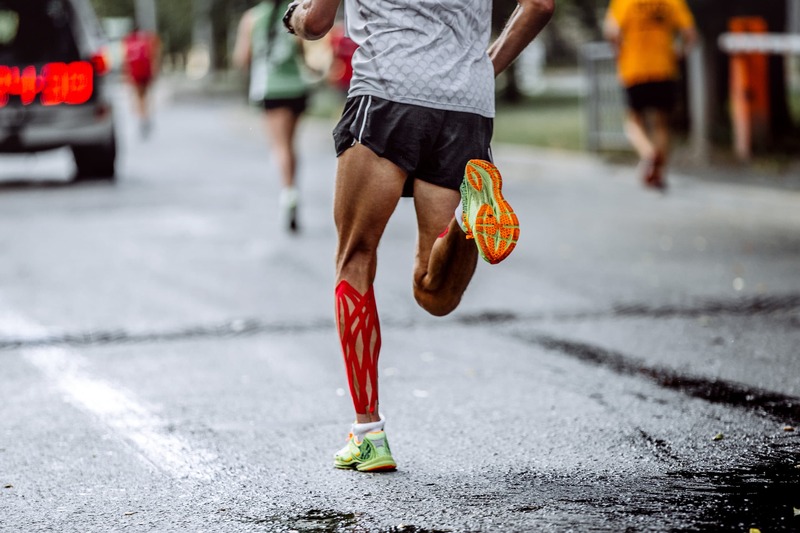 Another theory is that the Kinesio tape actually slightly lifts the skin and biomechanically reduces pressure on the pain receptors in the skin. Graston Technique facilitates healing and improves the ability of the plantar fasciitis to take load. Progressively strengthening of the foot and ankle combined with stretching of tight structures in the calf improves ability of tissue to handle loads placed upon it. HOW CAN A CHIROPRACTOR HELP Plantar Fasciitis? Sometimes people are confused about the fact that I treat a multitude of problems in the arms and legs. Many people think that chiropractors only treat low back pain or headaches. It’s true that a good deal of chiropractors focus on these problems but many treat a multitude of injuries that include the upper and lower extremities. As a Certified Chiropractic Sports Physician (CCSP), I have been trained to recognize and treat a variety of musculoskeletal conditions that many chiropractors do not treat. I’m also certified in the Graston Technique, which is a soft tissue technique that uses instruments to massage or scrape against the skin in order to reduce pain and increase function. I am authorized as a Graston Technique Specialist (GTS) and as a Certified Kinesio Taping Practitioner (CKTP). Kinesio tape can do amazing things and one of them is provided pain relief for plantar fasciitis. I am also a Corrective Exercise Specialist (CES) and I have the ability to improve function of the foot and ankle via rehabilitation exercises and stretches. With that being said, I don’t approach the problem from just the perspective of adjusting the spine. Depending on the person’s problem and the outcome of their exam, I have the ability to adjust the involved foot and ankle, loosen the posterior structures on the calf and ease pain on the bottom of the foot while strengthening the foot and increasing mobility of the ankle. HOW LONG DOES CHIROPRACTIC CARE FOR Plantar Fasciitis TAKE? One of the biggest issues regarding treatment for plantar fasciitis is how long the person has had the problem going on. The longer that the problem is been going on, the longer it will take to help the person get back to their life. It also depends on how much that someone is on their feet were continuing to aggravate the problem by exercising. People are going to recover quicker if they are off their feet more versus someone who is running 60 miles a week while training for a marathon. Another factor is whether or not a person is actually doing their exercises. I like to tell people that getting better is a participation sport. You have to be vigilant about doing your exercises and if you’re not willing to do your exercises then you’re going to suffer with the pain for longer than you should. People that are in the early phases of plantar fasciitis will occasionally get symptom relief in one treatment. The majority of people don’t come in early enough and there usually ends up being damage that needs to be repaired. Remember that plantar fasciitis is just a problem with poor biomechanics that leads to overloading of the plantar fascia. Because of this it’s usually an iceberg situation, where there is a deeper problem that’s below the surface but is not necessarily causing problems. It typically means that someone has a weak foot or problem with mobility and that a person will typically need to do exercises in order to help them prevent recurrence of the problem. As for the length of time that it takes to actually heal from plantar fasciitis, that depends. Sorry, I wish I had a better answer than that, but it just does. As I said, sometimes it can be only a couple treatments to get symptom relief. Again, there’s more work to be done after that. Other people can expect to start feeling better within a week or two. Some people that have more chronic conditions will start to notice that they have a change in their symptoms. They will have a situation where they noticed that the pain is not quite as severe when they go to stand up first thing in the morning. Or they notice that it takes less steps in the morning to warm up the foot so that they’re no longer limping. Or they’ll notice that they don’t have quite as much pain at the end of the day. Again, this depends on rest and exercises. Yes, plantar fasciitis is completely curable. I have regularly helped people who have suffered from plantar fasciitis for years. Some patients come to me after a couple months of pain and some have come to me after suffering from plantar fasciitis for over 10 years. The fact is that plantar fasciitis can be cured no matter how long the symptoms have been going on. The thing to realize though is that the longer that plantar fasciitis is been going on, the harder it is going to be to treat. Your recovery would also depend on how well you follow the prescription that given to include icing or exercises or even possibly getting custom foot orthotics that fit and function correctly. HOW LONG DO Plantar Fasciitis SYMPTOMS LAST? Plantar fasciitis that many providers find to be difficult to treat. It has the ability to become chronic quite easily. Because there is a lot of bad information about how to treat plantar fasciitis, it is unfortunately common to see patients suffer for years with the problem. I’ve treated a great deal of plantar fasciitis patients and there is a lot of variation on how long people’s feet have been bothering them by the time they come and see me. Sometimes, I’ll get patients when symptoms have only just started happening in the past couple months when they come in with a more pressing problem, like neck or low back pain. In other cases, I will have patients that will have had the problem for years. These are patients who have been to their family doctor, multiple podiatrists and have been through multiple rounds of physical therapy. I have seen corticosteroid shots fail and plantar fasciotomy surgeries fail It is quite common to see patients who have had the problem for 2 to 5 years and help them get rid of heel pain. I’ve even seen patients that have had plantar fasciitis for over 10 years and help them fix the problem. It is definitely not something to mess with and it is much easier to treat when you’re catching it close the beginning of the problem. But regardless of how long the problem is been going on, there is hope. WHAT ARE THE TYPICAL MEDICAL TREATMENTS FOR Plantar Fasciitis? 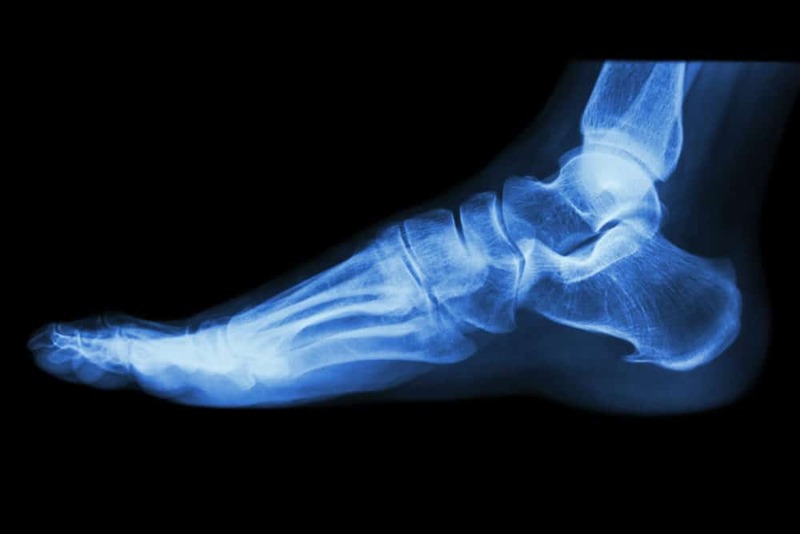 Often, one of the first things that is done is plain film x-rays, which are typically unnecessary according to the guidelines on taking x-rays, like the Ottawa Foot Rules. When it comes to the actual treatment recommendations, it depends on the provider that you’re seeing. Podiatrists will typically recommend treatment with ice, stretching, off-the-shelf arch supports, non-steroidal anti-inflammatory drugs, and corticosteroid injections. Custom foot orthotics, that often cost the patient over $600, when obtained from a podiatrist may be recommended at some point as well. If there is little or no improvement in six months, they may suggest using a boot (ankle foot orthoses – AFO) or even casting the foot and ankle. The podiatrist may recommend surgery as well. Often, a referral may be made to physical therapy. Physical therapist will also work on stretching and activity limitations. Night splints may be recommended by either physical therapists or podiatrists. Some physical therapists also offer off-the-shelf arch supports or custom orthotics. Specific foot exercises may or may not be taught. In my opinion, there are a lot of treatments for plantar fasciitis that just do not make sense. Stretching the plantar fascia itself is literally applying a load to a structure that is sore and inflamed because it is been overloaded. The inflammation can be calmed down by things like ice, non-steroidal anti-inflammatory drugs and corticosteroid injections. The inflammation can also be calmed down by restricting the patient to a boot or a cast. Treating the inflammation and the pain is a good idea but the problem is is that putting out the fire temporarily does not change the fact that the underlying problem that caused the plantar fasciitis is still present. There needs to be changes in how a person uses their foot and engages their muscles in order for there to be a long-term change in pain. Once a person resumes normal activities, the pain will probably flare up again. Otherwise, the person will need to restrict their activities for the long-term, which has other serious health consequences. This may be a good time to point out that a podiatrist is trained as a foot and ankle surgeon and these surgeries make them a lot of money. Remember that anytime that anybody recommends surgery, I would recommend that they get a second opinion before they get cut. Anytime that you decide that you are going to have surgery, you should have exhausted all the possible conservative treatments beforehand. Surgery for plantar fasciitis is even controversial within podiatry has some estimate that surgery is only needed on about between 1-5% of plantar fasciitis patients. Remember that cutting on the plantar fascia is going to have biomechanical consequences because the plantar fascia supports the arch of the foot. Cutting the plantar fascia may temporarily reduce pain associated with plantar fasciitis but it is going to set the patient up for further foot and ankle problems in the future. It may even cause problems of the kinetic chain as problems with the foot can cause issues with the knee, hip, low back and more. WHAT ARE THE RISK FACTORS FOR Plantar Fasciitis Treatment? There are legitimate concerns about the typical treatments for plantar fasciitis. 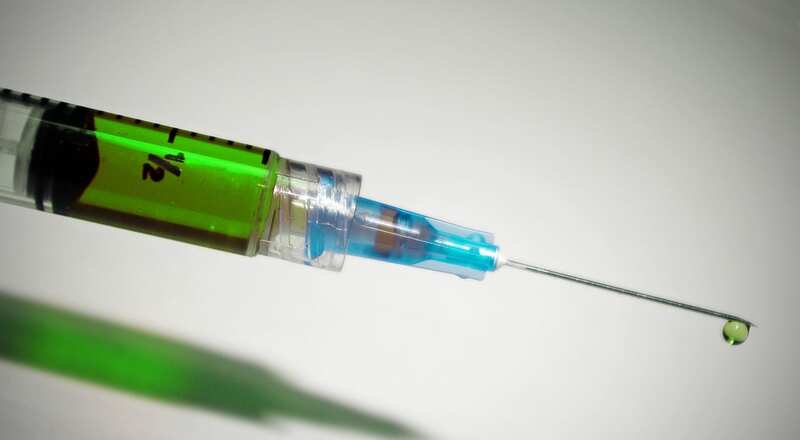 One paper stated that tendon and fascial ruptures are common complications of injected corticosteroids. This means that plantar fascia that is injected with corticosteroids is at a greater risk for rupture. When it comes to surgery, there is not consensus on the best method or even best location for treatment. Some state that the surgical release should be done to the plantar fascia and some state that the surgical release should be done to the muscles in the back of the leg. 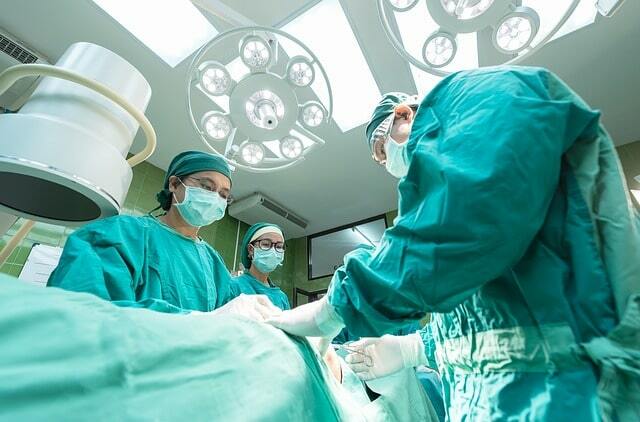 Complications following surgery can occur and can include persistent heel pain, permanent numbness and tingling in the foot, soft tissue healing problems and infection. Almost half of patients who have surgery for plantar fasciitis continue to have significant swelling and/or tenderness in their foot almost 5 years post-surgery. How difficult is treating heel pain in runners? To schedule your free, no obligation consultation with Dr. Royer, call the office at (419) 517-5055 or click to contact us.